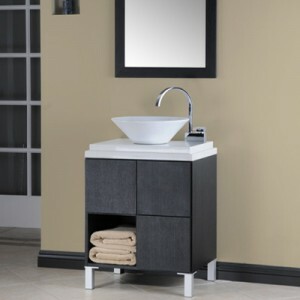 ‧Includes Euro-Design Stylish Vertical- Mounted Mirror. 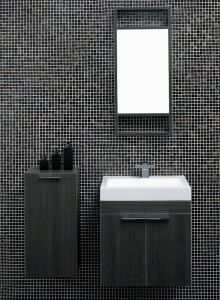 Tonusa presents the perfect solution for small bathrooms and compact spaces. With components measuring no more than 23 inches in width and 19 inches in depth, The T-580-I will surely fit any space requirement. 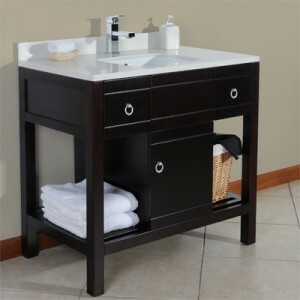 Although compact, this vanity set features durable specially-laminated cabinets which maximizes space for all your toiletries and bathroom items. 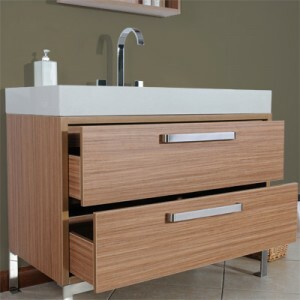 An independent storage system, the side storage cabinet features shelves while the main basin cabinet has convenient swing-out doors to reveal a generous storage capacity. Distinct finishing touches include corner-to-corner single-piece cast-polymer washbasin and an attractive Euro-design matching vertical mirror.